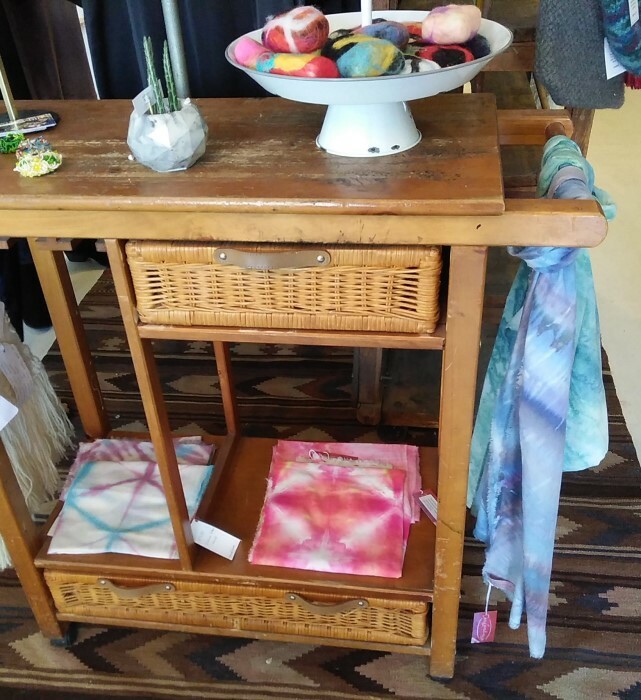 My hand dyed scarves, housewares, pillows and photography are available in a pop-up at my day job. 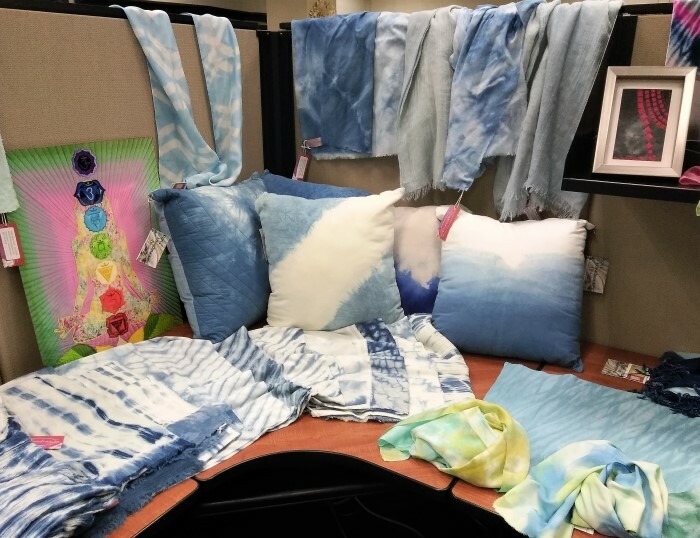 I am so fortunate to be able to share my love of dyeing, creating and crafting with my coworkers. Empty corner desk now filled with hand dyed gifts. Perfect time to pick up a unique handmade item for your mother, father, sister, brother, girl friend, boy friend, anyone you love! 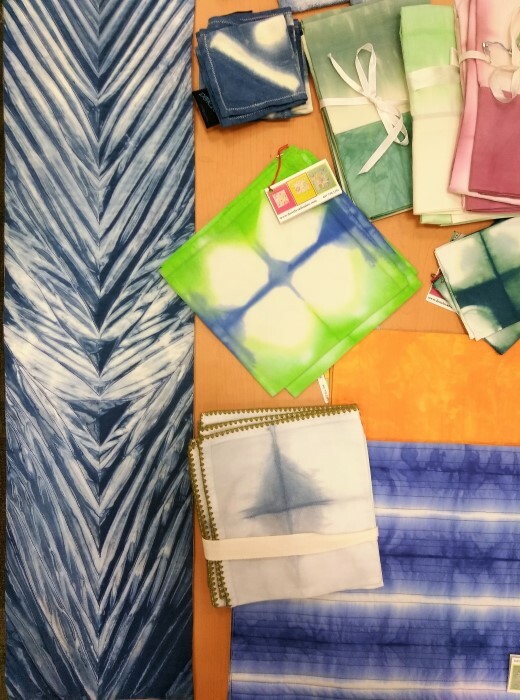 Cotton, silk and cotton, cotton double gauze, cotton voile, cotton/rayon, and cotton lawn indigo scarves. Many fibres and many colours are available! One will suit you. A mix of quilted art postcards, light up postcard, and fine art greeting cards. One of my co-workers persuaded (threatened) me to bring in the first few scarves I made after having taken an indigo dyeing workshop. She was the first to purchase two scarves from me. She encouraged me, rooted for me and supported me. I will be forever grateful for the friendship we have. Thank you to all of you that have supported me by purchasing handmade! 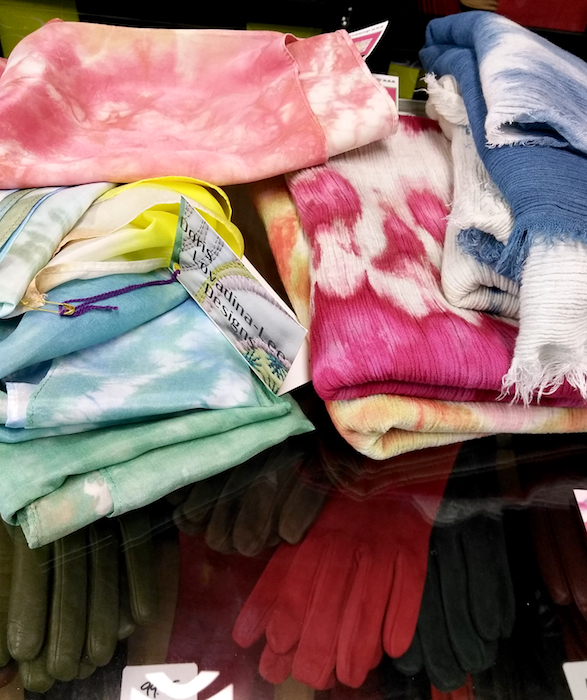 Hand dyed shibori scarves at Field & Flower shop! 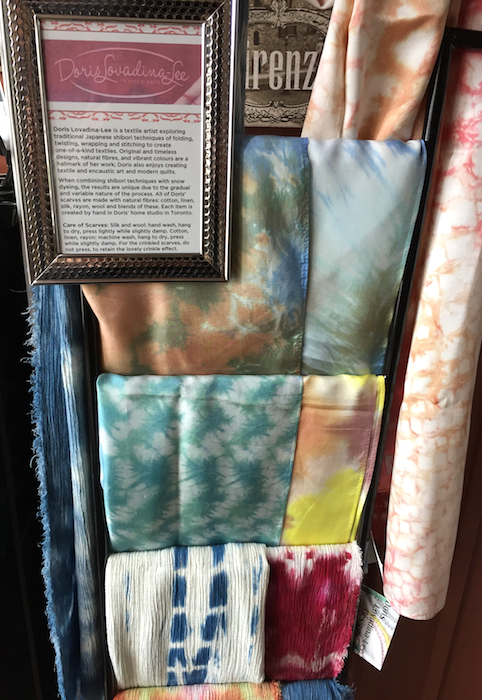 I am happy to have my hand dyed shibori scarves available at a Field & Flower located at 2005 Danforth Ave. Toronto, Canada. 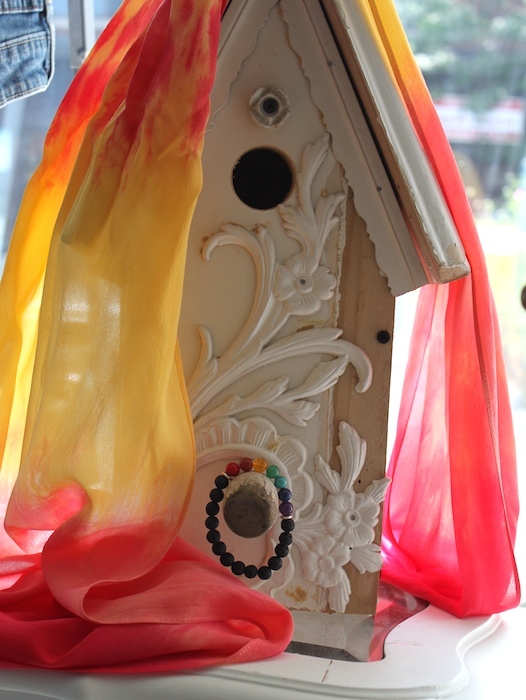 Colleen Imrie is the owner of this shop that celebrates nature, beauty and simplicity. 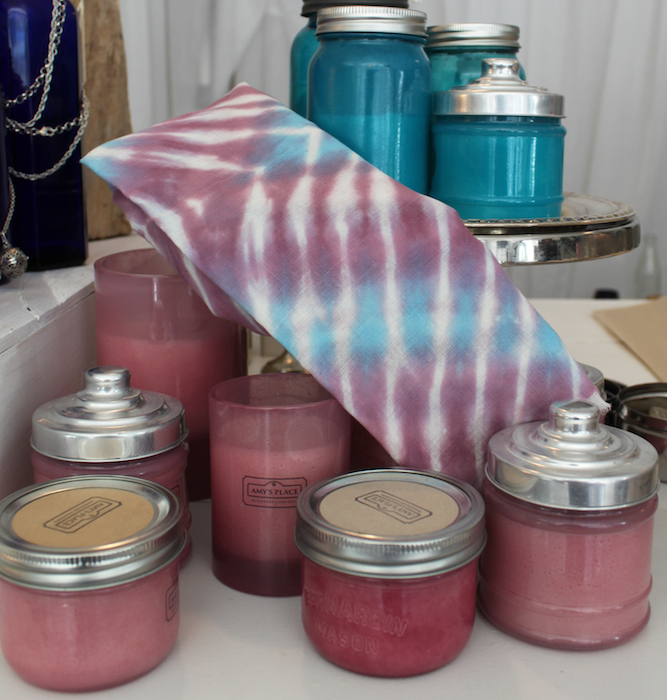 She stocks locally handmade items such as soaps, aromatherapy products, jewellery, clothing and my hand dyed scarves. “that will soothe your senses, comfort your heart, and warm your home; little tokens that life feels good”. 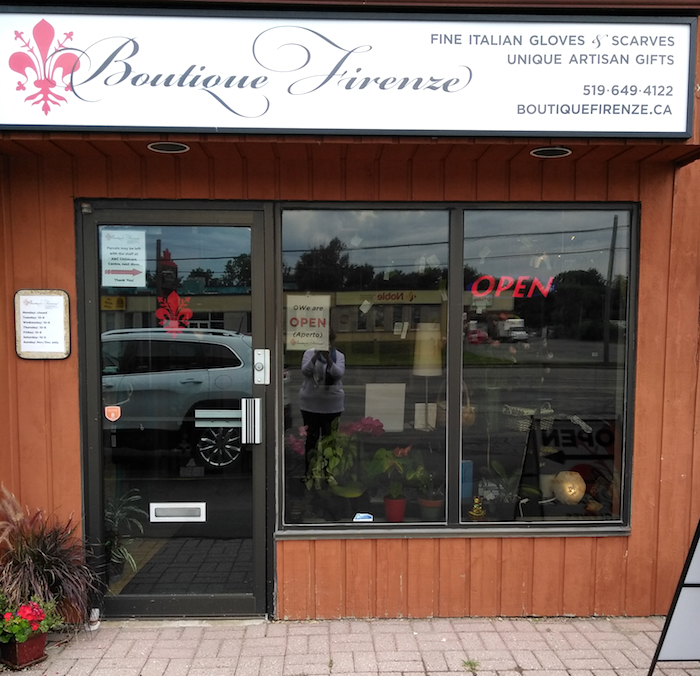 Boutique Firenze is a gift shop in London, Ontario. It is the dream of owner Bettina Weber and husband Len Elliot. 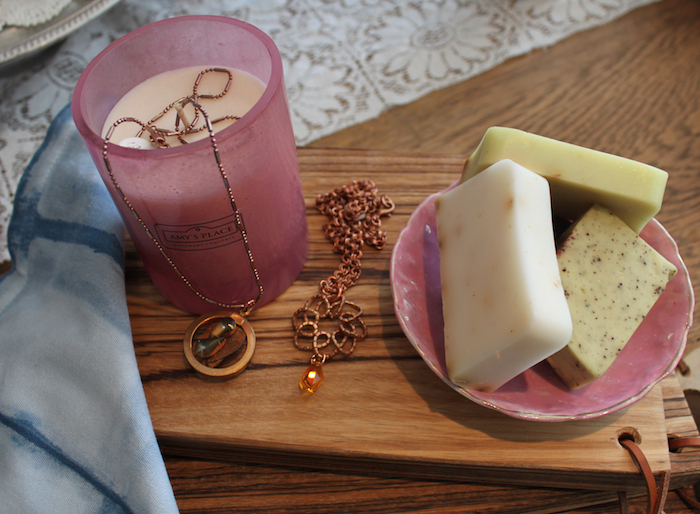 They travel to Italy to personally select the beautiful items available for their shop. 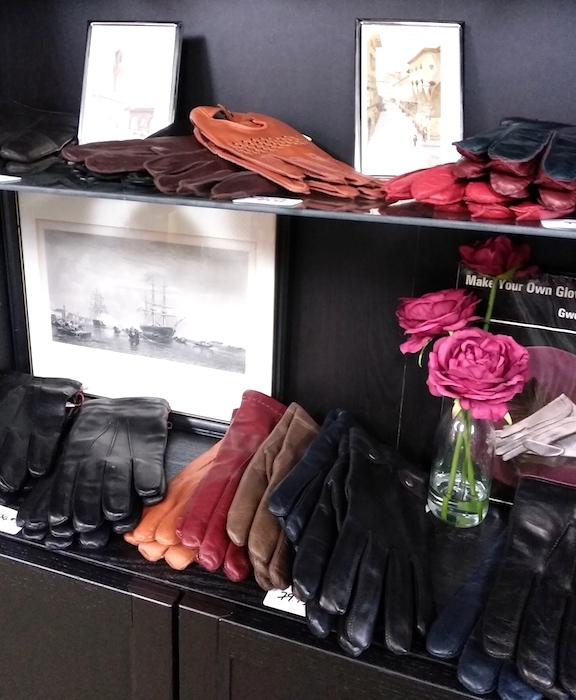 Luckily, you won’t have to travel to Europe, to purchase fine quality leather gloves, silk scarves and hand crafted gift wares. This bricks and mortar shop has only been open a short while. 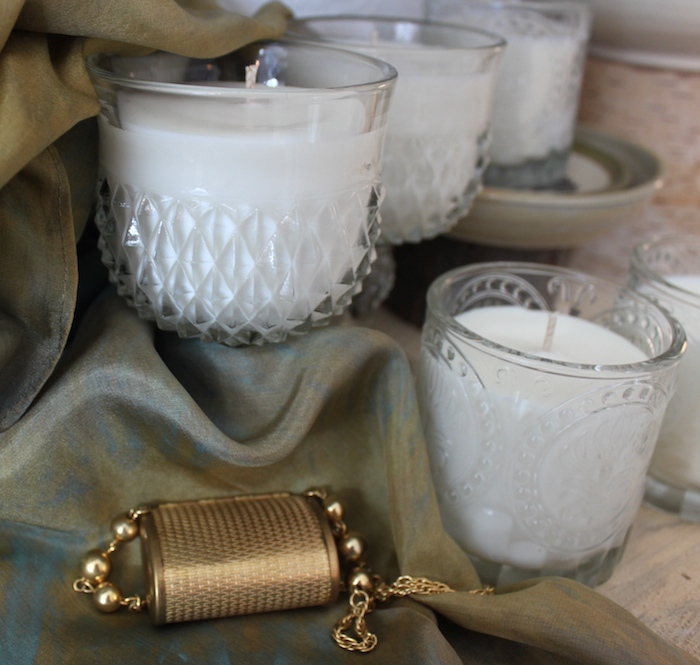 Previously, the owners worked at selling these luxurious yet affordable items part-time. 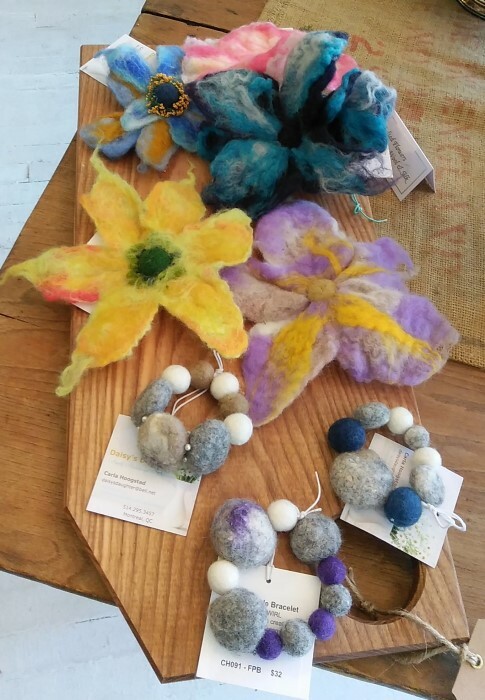 Boutique Firenze also carries a selection of fine handcrafted items from Canada including my scarves! 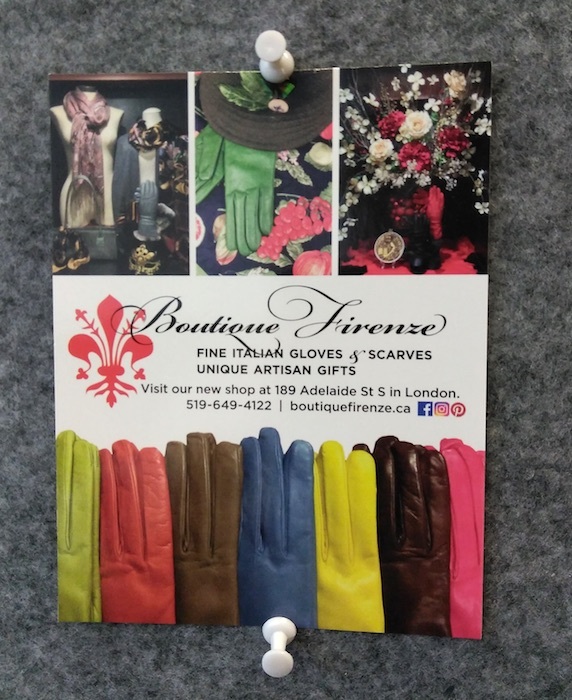 They coordinate very well with all the beautiful gloves they carry from Florence. Gloves for the man in your life. 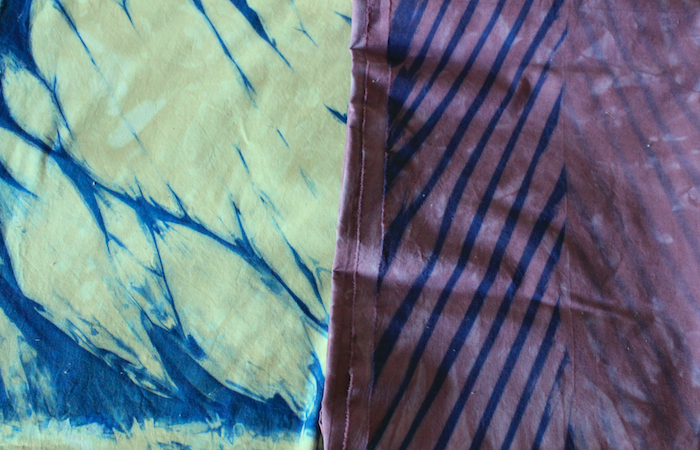 Snow dyed, shibori and indigo dyed scarves hand-made just for you. Visit to see the selection. 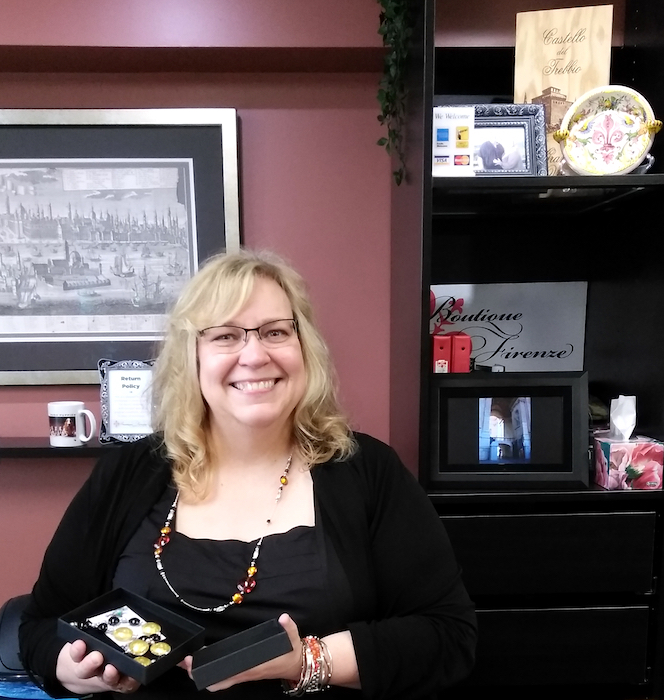 Whatever you are looking for, the perfect gift to give or for yourself, Bettina will be happy to help you. 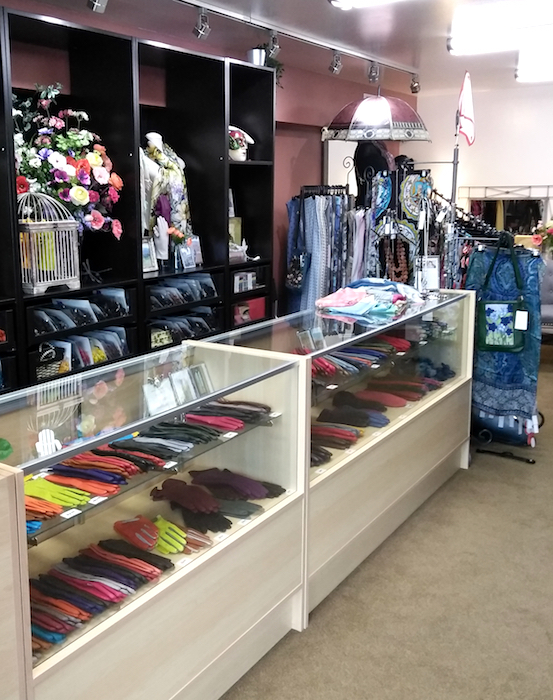 I hope you have the opportunity to visit the store and see the selection of gifts available, including Murano glass jewellery, and my scarves of course! Handcrafted items of all types are on display at the gift shop in Museum London. 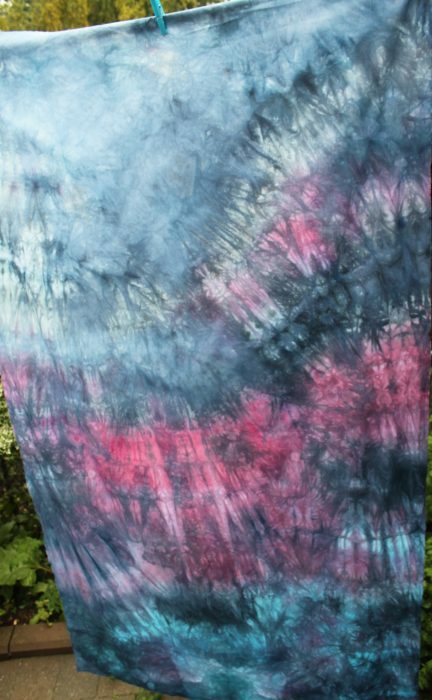 Including a selection of my hand dyed shibori scarves! 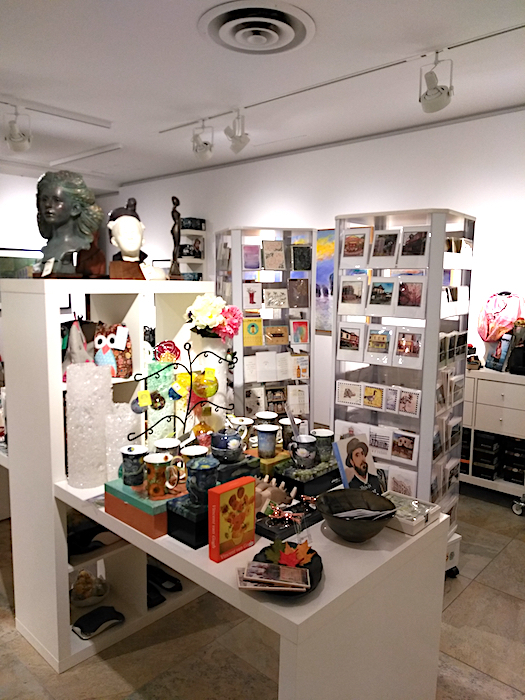 The gift shop in the lobby of the London Museum specializes in selecting artwork and crafts from local artists. 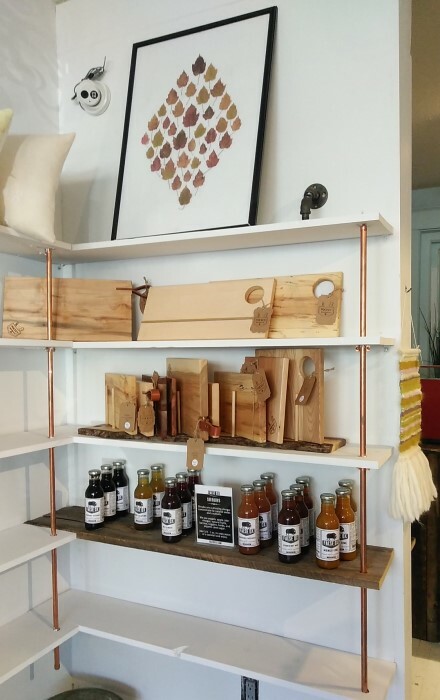 They have a large selection of handmade ceramics, glassware, woodwork as well as a variety of art cards for any gift you purchase. 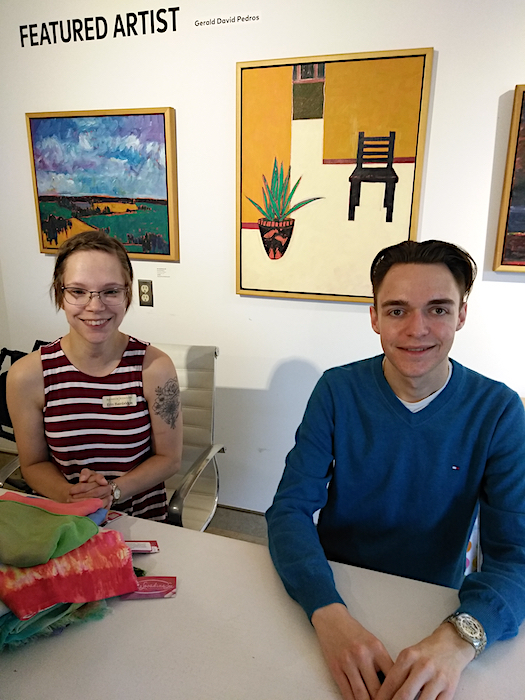 Ask Erin and Fraser to help you pick the perfect gift from the beautifully curated selection at Muse Shop + Rental next time you visit Museum London. Don’t forget to look for my scarves! I’ve been following Jess Van Den from Create and Thrive for a couple of years and have listened to most of her podcasts. She began her career as a science teacher in Australia, started making jewellery for fun, then selling it online which then led her to eventually make Epheriell her full-time job in 2010. Jess set up an etsy shop to sell her handmade jewellery and had many people ask her questions about selling online. She began Create & Thrive to teach others how to turn their handmade hobby into a thriving business. To listen to her complete story tune into her first podcast: Episode 0 – Jess’ Story. 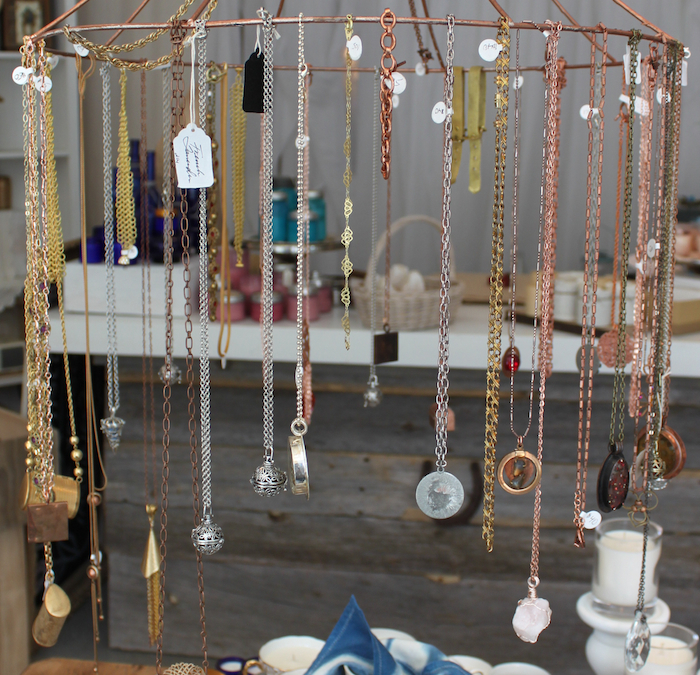 Jess offers many ways to help individuals learn the business of selling handmade items online. Some of these are free like: 10 Essential keys to successfully sell handmade products online. Others such as, Set Up Shop are fee based. All of her information is very practical, down-to-earth, and realistic. One of her sayings: “It’s a marathon, not a sprint”. It takes time, patience and the willingness to persevere to attain your goals. Part of being successful is knowing what your goals are. Jess is offering a 30 day free course that I am participating in called: #MakingItPodcourse. Each day for 30 days, Jess talks about mindset, money, marketing, and business management especially for those who are makers. None of the podcourses are long, ranging in length from 10-20 minutes. She refers back to her podcast list for those who would like more in-depth focus on the topic. Each podcourse has an action item for you to consider each day and a printable one-page course summary. Although this course started the July 1st, it’s not too late to start. I encourage you to do something, don’t wait until everything is perfect before you begin. There is no perfect time or set of circumstances. Just begin, remember it’s a slow steady marathon! Surround yourself with a support group. They could be your family, a group of friends real or virtual who are on the same path as you. I am going to share a meal with a few real life friends this week so we can share, commiserate, celebrate and help each other in our businesses. What will you do to turn your dream into the successful business you desire? Help, guidance, inspiration and motivation can be delivered to your In Box! Last week during the panel discussion at the Toronto Modern Quilt Guild, three of us shared our journey into Monetizing Your Craft! The time went by so quickly that I didn’t have time to mention the resources I find helpful in crafting my business. Listed below are just some of the many resources available on the web. I have enjoyed listening to these people talking about their passion. I encourage you to have a look at the sites above. You will find some that speak to you and others that won’t. When you find some those you enjoy, sign up for their newsletters, YouTube channels, and feeds. Support these creative entrepreneurs! Please let me know which blogs, podcasts you have found informative or just fun so I can add to my list. Enjoy! Monetizing your craft aka selling your stuff! The Toronto Modern Quilt Guild asked me to participate in a panel discussion with Bobbie of Geeky Bobbin and Claudia of Fabric Please! The three of us are all fairly new to having an online business. Bobbie has been at this the longest at about one year and a half. Claudia has been running Fabric Please! for just under 2 months! She talks about her jump into selling online in this blog post. It was a lively discussion and I hope members came away with an appreciation of the time that is needed to having an online presence. We were encouraged to bring samples of our craft to show the members and to sell to them too! 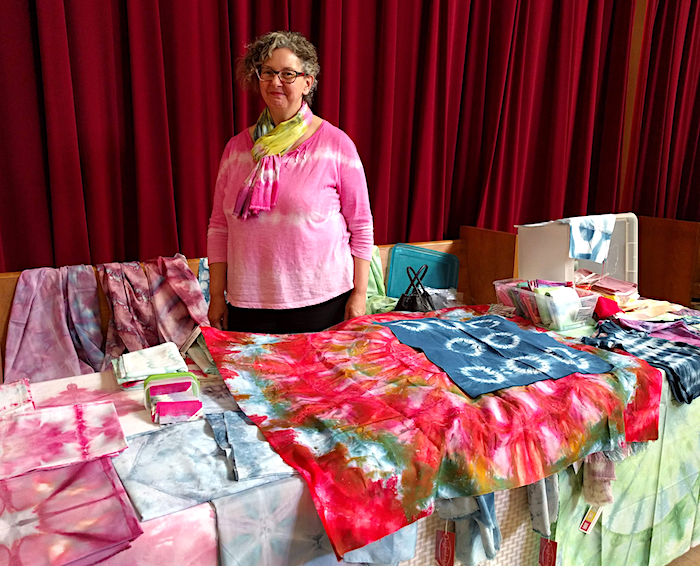 I brought a selection of my snow dyed scarves and hand dyed quilting cottons. I was so caught up in preparing for the panel discussion and setting up my table that I totally forgot to take any photos. Thank you so much Laura Henneberry for taking great photos and allowing me to share them here. One of the most repeated lines from the members was that the hand dyed fabric was beautiful but they didn’t know how to use it in a design. So, I thought I would show a couple of examples. 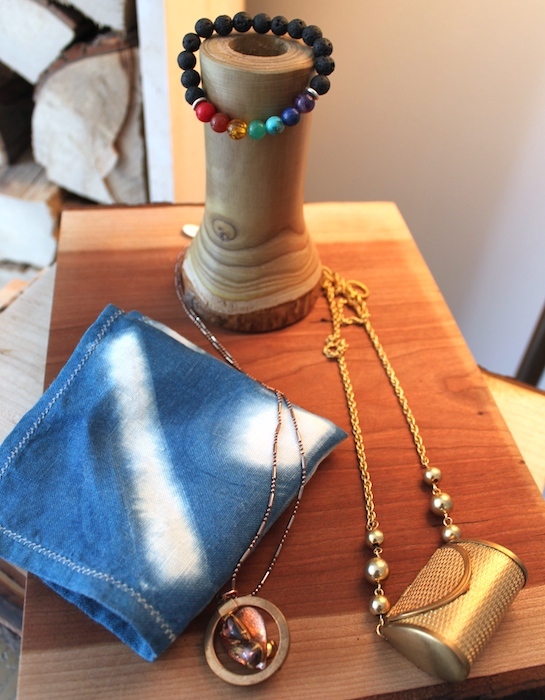 The piece above is a fat quarter dyed in indigo. The circles were created by wrapping the fabric around a small object and holding it with a rubber band. When the bands were removed the white circular design appeared. In the quilt below, the dark strip inserted on the right hand side was cut and pieced from a fabric similar to the fat quarter above. 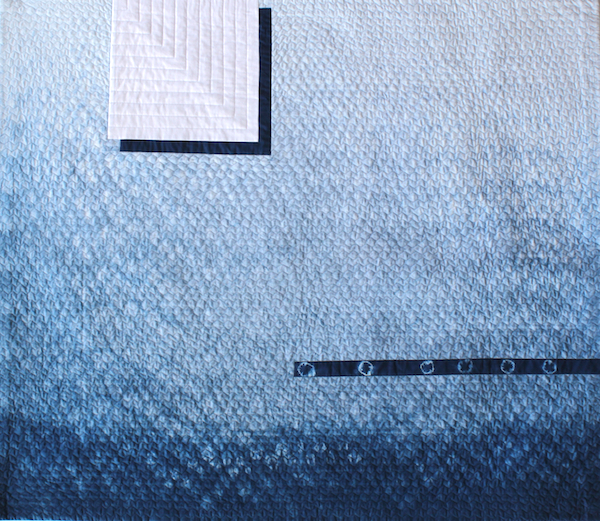 Atmosphere was created from a large piece of indigo dyed cotton. I loved the pattern that was created and I didn’t want to cut into it. This minimal modern design evolved from this. 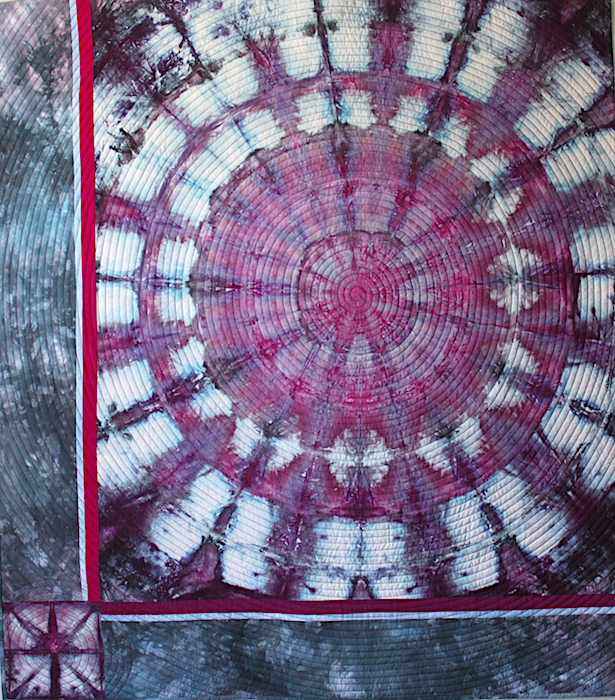 Over the winter, I dyed a few pieces of cotton with snow creating mandala shapes! Again, I didn’t want to cut them up into smaller pieces. 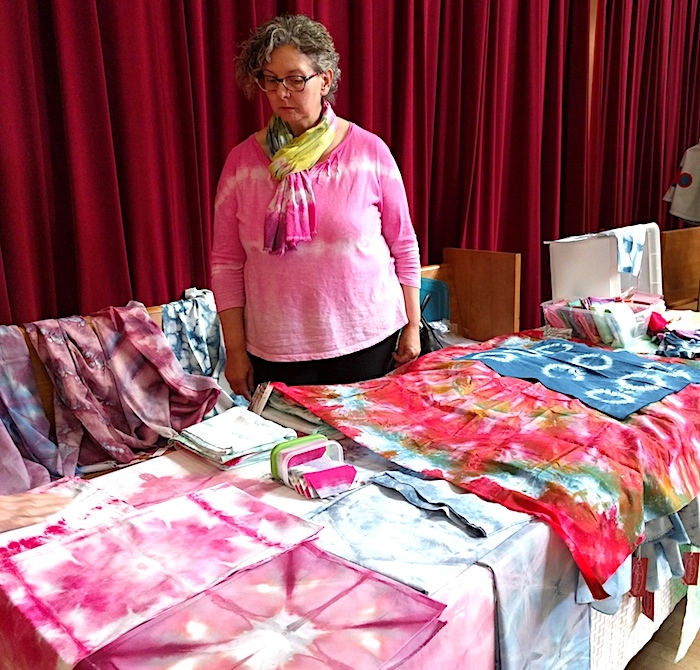 Cosmos was created with one of these mandala dyed cottons. The quilt top was simply spiral quilted to reinforce the circular design. Above is a detail of a brightly dyed mandala that reminds me of a bright tropical fruit. 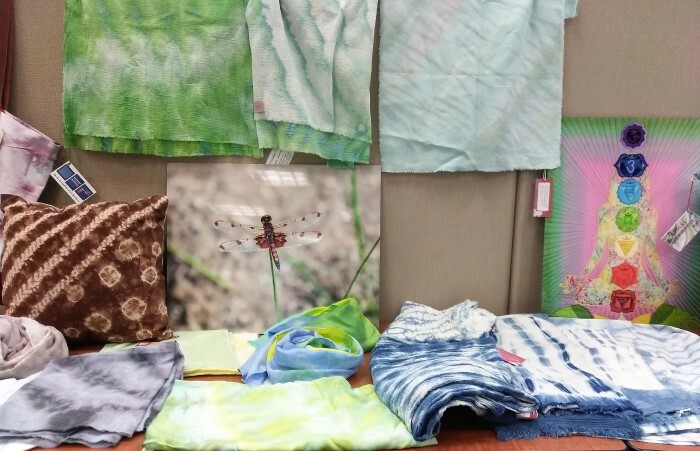 Don’t be afraid to use these unique pieces of hand dyed cottons in your design. They can be combined with commercial cottons and can enhance any project. 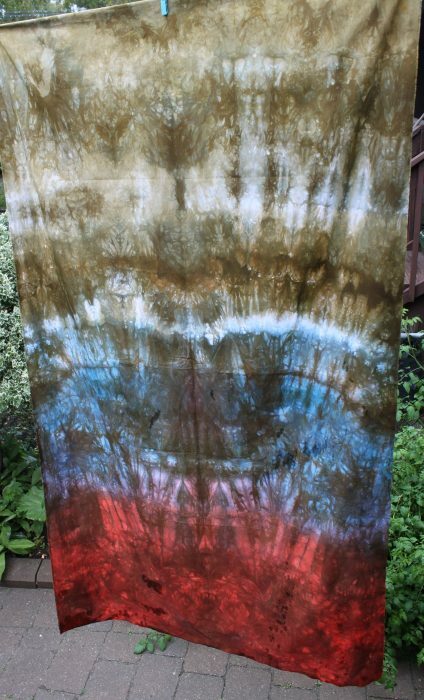 I will be adding some of my hand dyed fabrics to my online shop shortly. Check back often. If you see a fabric in the photo above or on my Instagram feed that you are interested in, contact me and I will be happy to send it to you. 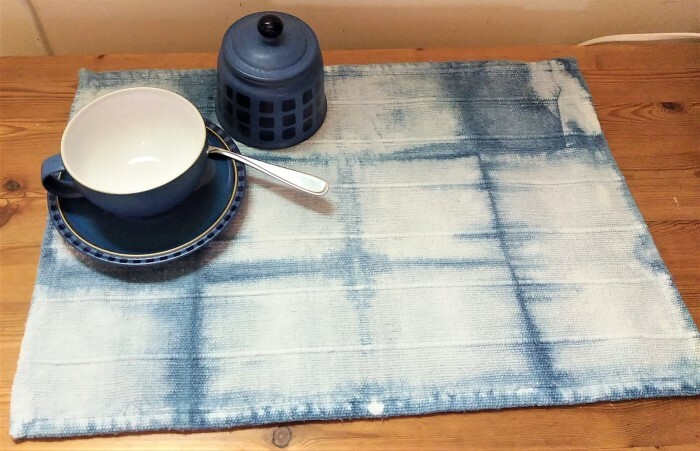 Are you inspired to use an original piece of hand dyed fabric in your next project? Finish up, or start your Christmas shopping at the Yorkshire Rose Quilters’ Guild Festive Market! A selection of beautiful hand crafted items will be available from our members. 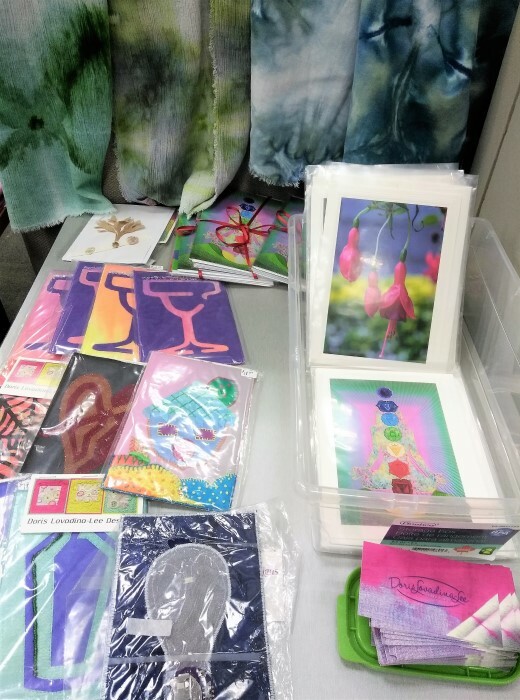 Hand dyed scarves, pyjamas, knit clothing for American dolls, soaps, pillowcases, book covers, preserves, cat toys, knit socks, and Christmas ornaments are just a few of the handmade gifts available. Admission and refreshments are free for everybody, so bring a friend or two. Enjoy delicious Christmas goodies provided by the Guild Executives. Pick up a complimentary ballot to win a door prize. Bring your cash, as most vendors won’t have machines to accept credit or debit. No, I am not redecorating! I am preparing a display for the holiday market: Shop the SLC. This event takes place at Ryerson University’s Student Learning Centre at 341 Yonge Street in the first floor Amphitheatre during November 20th-24th from 10am-4pm. 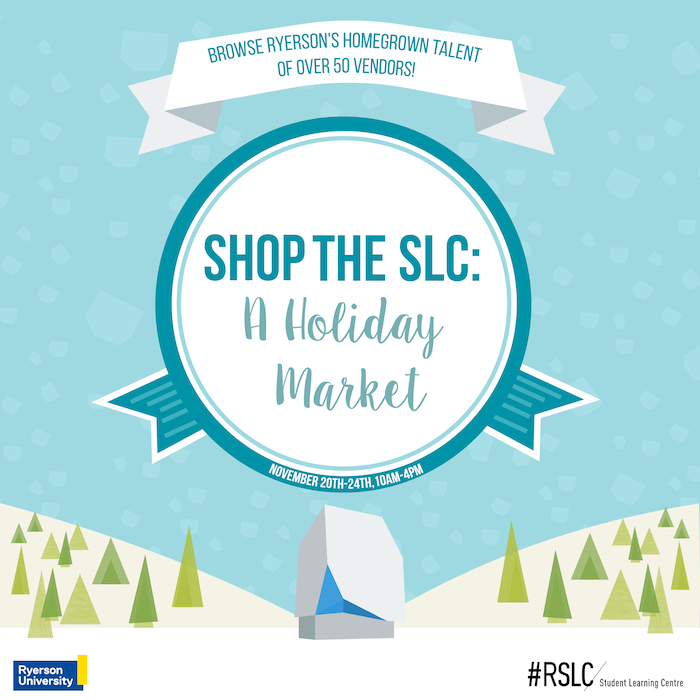 Shop the SLC brings Ryerson students, alumni, staff and faculty together to showcase their home-grown talent and entrepreneurial spirit through a handmade craft market. 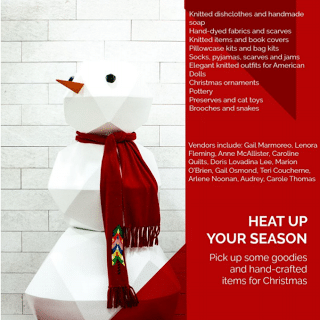 Have a look at the list of vendors, showcasing their unique, one-of-a-kind products, perfect gifts for those hard to shop for people on your holiday list. 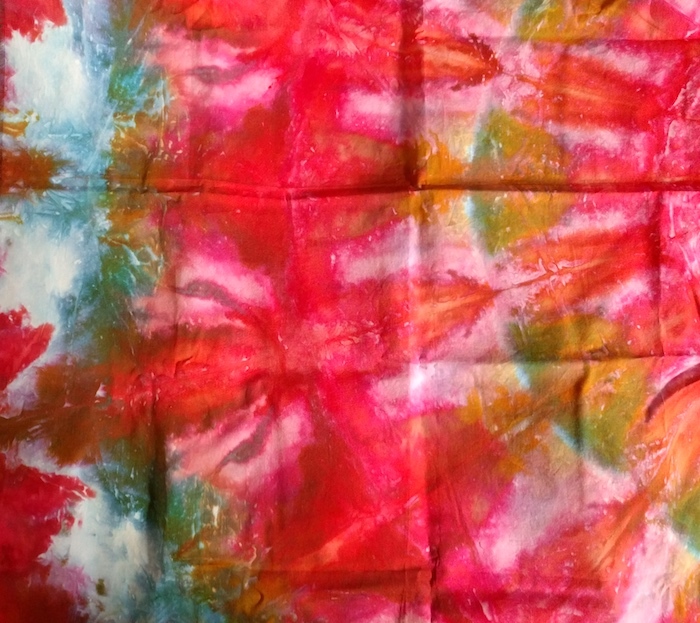 I will be selling my hand dyed scarves, placemats, napkins, and handmade cards. In order to display my scarves, I’ve taken an idea from Amy of Amy’s Place Handmade, and repurposed an old lampshade. By removing the fabric cover and leaving the wire, I will be able to display a selection of my hand dyed shibori scarves next week. 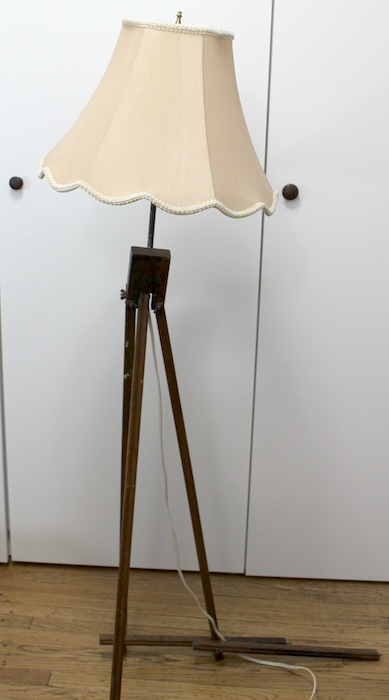 This shade is attached to an old surveyor’s stand that my husband purchased. 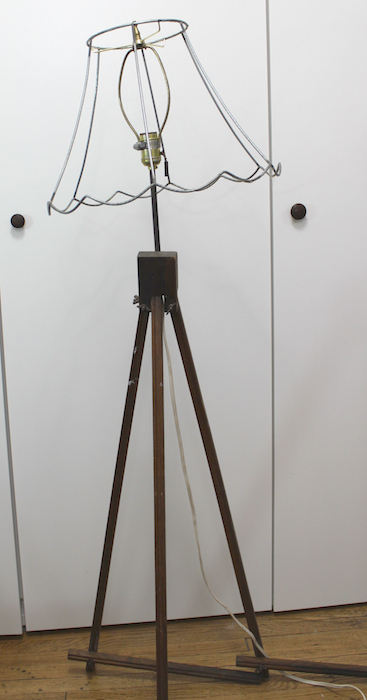 It had been converted into a light fixture. I think it makes a great display stand! Testing out the display with some of my scarves. 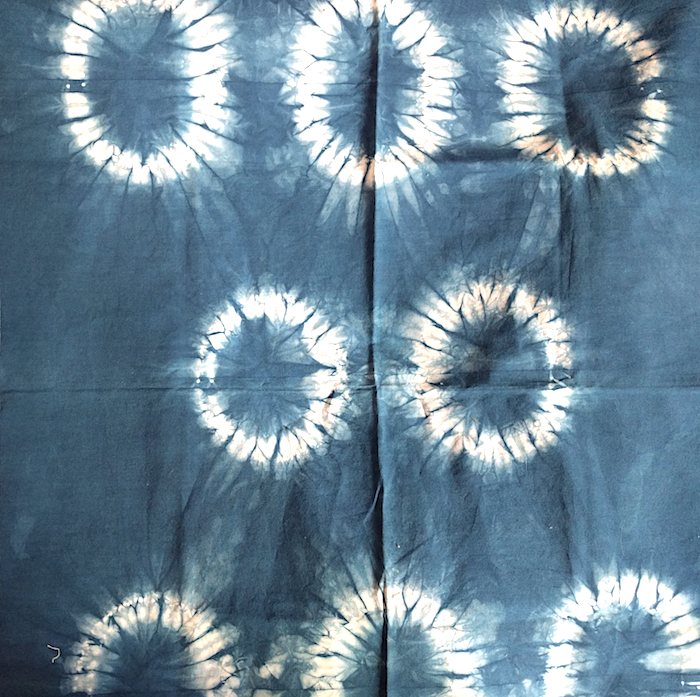 I have many new shibori scarves in silk, cotton gauze, and a wool/silk blend. I will be bringing mixed media greeting cards, small zippered pouches, indigo napkins, placemats and more. There will be lots to see! 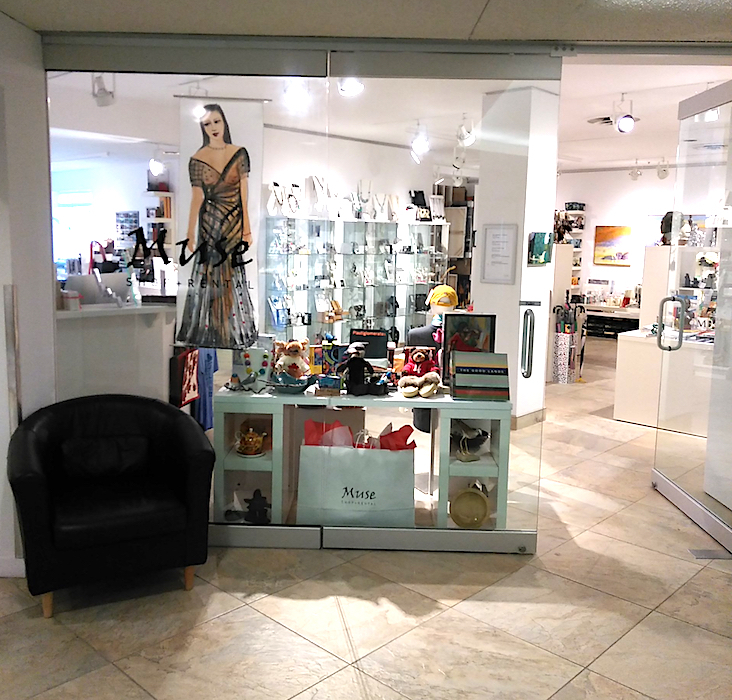 Come out and find a unique gift or treat yourself to one-of-a-kind items; from fashion and food to handmade crafts and custom artwork, there is something for everyone. Each day will feature different Ryerson vendors, including me! Hope to see you next Wednesday November 22, 2017 from 10-4. Drop by and say hello! Summer is a time for enjoying the outdoors. This Labour Day weekend spend time at the new Trillium Park at Ontario Place. I will be displaying my hand dyed original scarves along with 30 other vendors at the Urban Market. This event coincides with the 150th Anniversary Festival at Ontario Place. Amy from Amy’s Place Handmade, Peggy from Jewellery by Peggy and I will be showing off all of our beautiful handmade goods at the Urban Market. Amy, Peggy and I hope to see you there!